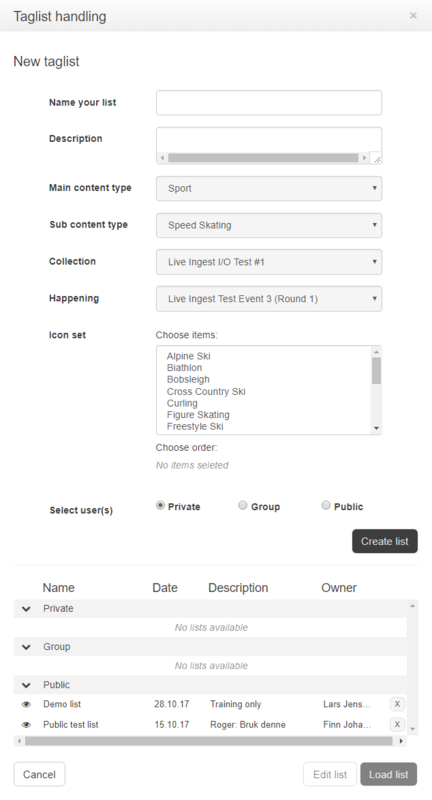 Start your live tagging by selecting a live ingest stream, represented by a place holder, from Workspace 6 (W6). Then select W7 for live Event tagging. You will find the Event tag list on your left side with the default Tab already selected. All assets will always hold one “Official” Tag-list, but may have other, created by tag representatives or your colleagues. The official tag list is created live by one or several representatives. They are responsible for the content in the official list, and it is protected from modifications by any other tag representative. It could be empty but may contain already tagged events. The Tab to the right of the official list (New/Open+) in the Tagged event list provides the details and metadata collected from the live stream (broadcasted event). Besides the default list (Official), you may create your own additional Tags list. Name your list and fill in an informative description. The next four input drop-down frames are not editable. The metadata are inserted automatically from the live stream. Icon set. These icon collections will be visible from the main menu and reflects the event you are tagging. The icons are placed there to help the you identify the event “type” as fast as possible. We will get back to the application short cuts later in the article. Select one or several Icon sets by clicking on the event item while holding down the Ctrl key (pc). All the available lists are listed in the lower end. They are also available from the “Official” tab list in the main menu. To hide uninteresting list from the main menu Tab list, you can click on a list “eye” icon to hide it. Click once more to make it visible again. The “Load list” button has the same function. Select the hidden list by clicking it once and the press the “Load list” to make it visible (or loaded into main menu tab). If you have admin rights, you may select a list and press the “Edit list” button to modify it. Look at the right side of the main menu. The title module in top center provides time/date, location and the event you are connected to. An indicator will light up when the event is live and you can start tagging. When you create an event, Mediabank will use your computer clock as event time. So it is VERY important that you verify and synchronize your computer clock before you start event tagging. Your main concern is how to tag as efficient as possible, and what if a new event occurs while still in edit on the previous event. The most critical is to place the tags time stamp as correct as possible to the point of event occurrences. Hit spacebar – An unidentified (neutral) tag is created and immediately recorded and visible in tag list (left side). Next step is to identify the type of event. Select from the available icon collection and click the one that represent the event type. The tag list will update the active event with its correct identifier and change the icon accordingly. More about the event edit later in the article. Click the corresponding Icon directly (omit spacebar). The same procedure as above, but the event is directly identified in the tag list. Press the letter “i” or press the button “Mark in”. This is the same as pressing spacebar or the button “Event time” except for the Tag length and behavior. Explained later in this article. The only way to create a tag with reference to Mark in, is to click on the “Mark in” button or by pressing the letter ”i” on your keyboard. Any other tag creation will be as an Event with Pre- and Post-roll. Different Tag states in the tag list window. Red – Same as above, but not active. White with Event icon and description entered. This tag is finished. Note that it can be modified any time later to enhance or correct the input. The below image reflects the tag edit options available. Observe that while you have tagged a previous Warm up event, you have chosen to tag and edit the interview before finishing the less important warm up tag. You are free to prioritize the importance and choose your own workflow. The difference between Mark in and Event time. It has a pre-roll of 10 seconds prior to the event occurrence. It has the occurrence time (in orange), and it has the post time of 20 seconds. Default value (configurable) is an event duration of 30 seconds. These values can be modified individually for each recorded tag. You can adjust the occurrence time by clicking in the orange time field and press up/down arrow buttons on your keyboard. By doing this, you move the occurrence back or forth by 1 second intervals without altering the duration. Click in the Pre- or Post-roll frames to adjust the length in seconds from the event occurrence. By doing this, you also alter the duration of the event. By pressing “i” or “Mark in” you define the start of an occurrence. The default Duration is 30 seconds with a maximum of 999 seconds. To adjust it, you can write the desired duration in seconds directly in the duration frame. The end time will automatically adapt. Another way is to click in the end time frame and adjust the duration with your up/down arrow keys. To adjust the occurrence start, click in the occurrence start frame (orange frame) and adjust it with your arrow keys. The duration will stay constant, resulting in the end time adjusted accordingly. You do not need to use the “Set” buttons next to the time codes. The image reflects the available roles separated with different tabs. The information available are live metadata provided from the event management and may be subject to change during the event. It is easy to add individuals, just click in the desired tabs, and a drop down menu will appear, allowing you to make selections in an efficient manner. The selected individuals are made visible for you to see and their role are defined by color codes for easy identification. To further ease the event retrieval for later use, add relevant keywords in the "Search keywords" frame. Relevant suggestions are presented from a pre-defined database. A relevant and short "Event description" is also helpful. Below the event description, there are several destinations available. They are activated or deactivated by default, depending on the event but can be manually modified. Every active destination will receive your live metadata event registrations as media clips.